A new fundraising campaign has been launched by Bees4Vets with a raffle opportunity for the public to get behind. Proceeds will go to the 2019 class of veterans with PTSD, who can use beekeeping to learn mindfulness and staying “in the moment”. Bees 4 Vets has announced a new fundraising campaign to help raise money for 2019 program, while extending an invitation to veterans in the community with PTSD. 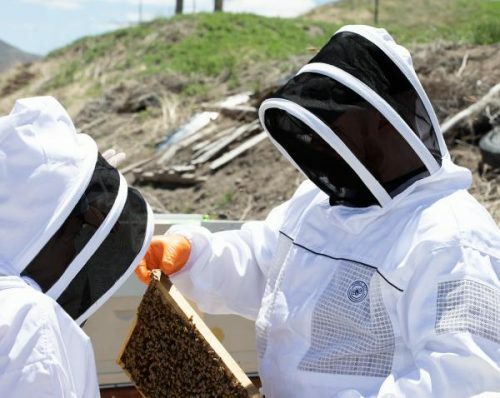 The company aims to assist military veterans impacted by PTSD or TBI who are trying to transition back into the general workforce through vocational beekeeping experiences. Bees4Vets offers the opportunity for getting out in the local community, combining outdoor activity with education and community outreach. They provide an environment of support and training where veterans can develop the interest and skills necessary to participate in beekeeping as a vocation or hobby. Beekeeping has been known to be a good vocation or hobby for disabled veterans since the end of World War I. The positive benefits of the activity were published in “Opportunity Monograph, Vocational Rehabilitation Series No. 37 Bee Keeping” in April, 1919. Now the public can get behind the project through the raffle opportunity, which will help fund the 2019 program with a fresh cohort of students. There are a maximum of 10 slots per year, and there are still some positions available for local veterans. Prizes in the raffle include a $1,000 gift card to be used at the Reno Peppermill Resort Spa Casino*, usable for rooms, the spa, or in the restaurant; a champagne balloon ride for two from Creative Impressions; and gift baskets with a range of items. The draw will be held on Saturday, February 9, 2019, or as soon as 1,500 tickets have been sold. It is a great chance for the local community to get behind the veterans in Northern Nevada. Those wishing to find out more about Bees4Vets can visit their website on the link provided above. *Bees4Vets and the raffle are not sponsored by the Peppermill Resort Spa Casino.